Children are so precious and beautiful that it's no surprise we often forget they are natural socialists. After all, they are raised with a steady diet of forced volunteerism, equal outcomes and candy sharing and it is normal for them to have a powerful authority that dictates how their world should and does operate. It also leaves them open to all the pernicious teachings of the education system – one that has made no secret of its anti-American and anti-capitalist agenda – and reinforces what well-meaning parents have drilled into their kids. It's a wonder how any young free market conservatives survive both their parents and the education system. CNBC's Joe Kernen is one of those rare parents who took a look at what his children were being taught in school and decided to speak out. An unabashed capitalist, Kernen was appalled at the level of antagonism towards the free market being transmitted to America's children. In Your Teacher Said What?! 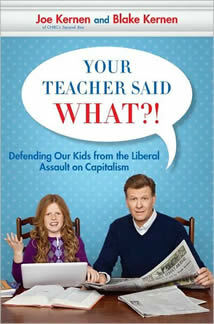 Defending Our Kids from the Liberal Assault on Capitalism, Kernen details the lessons he's attempted to teach daughter Blake, listed as co-author, and son Scott. Covering the period from January 2009 to December 2010, Kernen obviously had plenty of material to work with. The basic structure of Kernen's book is fairly simple; as major economic news stories broke he would hold a short Socratic dialogue with daughter Blake to teach her about basic economic principles. The rest of the chapter – whether discussing private property rights, unions or the economics of Wall-E – sees Kernen marshal evidence in favour or defence of the free market. Sometimes Kernen is successful in persuading his daughter to his point of view though other times it's fairly clear that she prefers a more interventionist government. Kernen has his job cut out for him. As Your Teacher Said What?! illustrates, America's children are bombarded with anti-capitalist messages from every conceivable corner. Along with 900 hours of school every year, children can reliably see those messages on popular television shows and movies that they spend roughly 1,500 hours a year watching. That doesn't include whatever editorializing they face in popular books, magazines and music. It's truly incredible to note that a child could pass from kindergarten to their final year in college without experiencing a significant pro-capitalist message in a classroom or see a movie in which the villain wasn't a businessman. What's so disappointing is that this book is geared towards conservatives. There was a time, not too long ago, when both Republicans and Democrats were reliable supporters of the free market. With the late 1960s takeover of the Democratic Party by progressives and occasional populism by Republicans eager to prove that they too care, it seems only the committed conservative today is defending the system that is responsible for virtually everything positive in the United States. Relatively few Americans even a few decades ago would have argued that the wisdom of the masses wasn't enough to organize their society, that government should not be in the position of dictating what sort of society the average American desired. Times have definitely changed. Although Your Teacher Said What?! is ostensibly about the journey that Kernen took in educating his children about the beauty of free markets, for any reader it's also a worthy defense of capitalism and a strong effort in correcting the many nonsensical assertions that the media and politicians have promoted over recent years. After all, if an elementary school student can readily understand capitalist principles with the examples her father provides from everyday life, an adult should presumably pick them up as well. Capitalism has had a tough slog lately, suffering for the sins of others, but hopefully Blake and Scott Kernen and your children will be the vanguard of the next generation's soldiers for free markets.